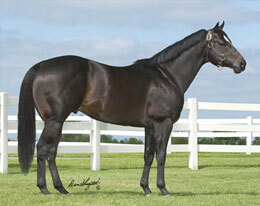 Ivory James sired AQHRA President's Open Spring Derby qualifier Wonderland. PHOENIX, AZ—APRIL 1, 2019—Wonderland, a 3-year-old daughter of multiple stakes sire IVORY JAMES, qualified for the $10,000-added AQRA President's Open Spring Derby on Sunday at Turf Paradise. Trainer Chad Ferguson saddled the bay filly for owner Tim Holdaway. Bred in Oklahoma, by Bobby D. Cox, Wonderland is out of the First Down Dash mare Shes Dashing First. A finalist in the Mystic Lakes Northlands Futurity Juvenile last summer at Canterbury Park, Wonderland has placed in six of 10 career starts and earned $10,022. For a complete list of qualifiers to the AQHRA President's Open Spring Derby CLICK HERE.